Why did I find a Flite Widgetbox advertisement at the bottom of my landing page? "Yola does not put any pop-up ads on your site." I do not recall setting up adverts on my website. Your screenshot did not seem to come through. Please can you try again? We'd like to take a look at this issue. However, today it seems to work. That pop-up is associated with your widget underneath. It is coming through from Widgetbox and not Yola. OK, thanks. Could you guide me what widget it could be, or are all widgets from Flite Widgetbox? Are the providers of free add-ons allowed to advertise just like that? I have the young child of a friend looking for a low-cost/free way of creating a website. Apparently they had seen other sites but inappropriate/irritating advertising was being splashed across the screen, so I recommended Yola. The mother went to my website and found the Widgetbox advertisement, putting her off, somewhat. Yes. The translation widget directly beneath the pop-up would be the origin. Widgetbox also allow the developers to place advertisements on or in their widgets if they are related to the product in some way. The providers of free web anything tend to mark or add advertisements to their products. Their argument is that it helps offset the cost of development and provision of such free products. That is interesting, since the Widget underneath is a link to Google Translate, if I am not mistaken. I guess you can't get the suppliers to adhere to the Yola way of doing it (small, discreet logo only)? Anyway, thanks for your (prompt!) help. You can try contacting the maker of your widget and seeing if they are able to take off the advertisement. There may be a cost for this though. What everyone needs to understand is that most widget makers make their living from making widgets.They do this by adding advertising or as a way to provide one way links to those willing to pay for them.You may not see the link as most do not pop up but it is still there and shows to search engines as an outbound link.Outbound links to bad sites can have adverse consequences. Always check into widgets you want to add to see what they are really offering. Many can be great tools for your site but all widgets are NOT created equal. Thank you for this really good information. Yes, thanks. I have yet to check what it is, but beneath is, I think, just a Google Translate facility. I also have to think from where I got it. I would hope that all suppliers offering via the Yola site follow Yola's policy. A discreet non-popping-up advert is fine. Wufoo (for online forms) does it, for example. 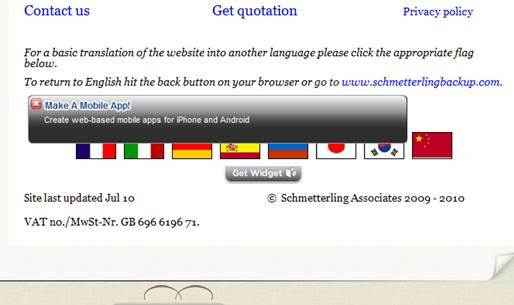 On the short order this Google translate widget is discrete and has no advertising other than the brand. It may be a suitable replacement for what you have and it doesn't use flags to identify language which is recommended by some commentators. Of course I like your idea of having the widgets without pop-up ads but don't know if Yola would have any control or influence over that aspect. The widget that you already have is created by WidgetBox who make and offer a huge range of widgets. You possibly selected it from the widgets available within the site builder under Widget Box brand. Gop - this is much appreciated! Glad to hear that your pop-ups are not caused by adware!